This entry was posted in Comments about Cycling on February 11, 2016 by Steve Tilford. Yesterday, Bill, my brother Kris and I went out for my birthday ride. The birthday rule we have around here is one mile for every year of age. I picked riding to Lawrence, which is around 60 miles, which would more than cover the rule. I have a sucking chest cold and wouldn’t have normally ridden anywhere nearly that far. Anyway, the wind was from the southwest blowing around 15, which is calm for around here. Bill and I rode the whole way over, with Kris sitting on. We got a cup of coffee and started back. It was super nice out, in the 50’s, but I still felt shelled. Bill and Kris started pulling back and I sensed a little half wheeling going on. We kept going faster and faster. My wattage had been pretty high going over and we were going way faster back, against the wind. After a few miles, Bill swung off and said he was tired of being half wheeled. I had planned on sitting on and taking it easy the whole way back, but found myself in Bill’s position, getting half wheeled. I verbally told Kris I didn’t appreciate the situation, but that didn’t do anything to alleviate the problem. I was mildly surprised that I could even pull next to him. My lungs are jacked right now. This kept going on the whole way back. My wattage riding over to Lawrence was around 260NP and then it dropped to 240 sitting on and it was back at 280 getting back to Topeka. Big effort difference. Anyway, since it is early season, it is a good time to address half wheeling again. This is the time of the season where the form differences show the most. Guys have been somewhere warm training, or even worse, training hard outside in harsh conditions, are riding next to other riders that have been doing basement time on their trainers, or even worse, not training consistently at all. Not bashing trainers, but the guys that have been outside a bunch are nearly always in much better shape than the basement dwellers. I hate getting half wheeled. It doesn’t really matter by who, but the stronger the rider, the more I dislike it. That being said, I do, on rare occasion, half wheel myself. I’m not sure that I actually half wheel because I am cognoscente of the action. To truly be half wheeled, or to be half wheeling, the half wheeler has to be oblivious to the action. The funny thing about the whole situation is that the rider that is “behind” is actually controlling the speed, so there really should be less mental stress. I’ve been unfortunate to be half wheeled by some pretty great riders. Like I said above, the better the rider, the more stress it causes the rider on the receiving end. The most famous rider I was half wheeled by was Bernard Hinault. I didn’t train with Hinault enough to know if he is really a half wheeler, all I know is that I was riding with him, before a time trial in Colombia, and he definitely half wheeled me for 30 minutes or so. Michael Engleman half wheeled. Nearly always. And he was strong enough, more than strong enough, that you should have been stressed. Micheal was so strong that he could keep nearly any pace, virtually all day. I didn’t mind it so much from him. He and I lived together in Boulder and I rode with him a ton. I like training hard and once you get used to the situation, it really isn’t much of an issue. It’s only when you’re having a really bad day that it wears on you. Before the Tour of the Americas, back in 1988, we were training in Florida and I’d do some pulls with him at the front of a group of 10 for over 30 minutes at 25 mph +. Sometimes for an hour. Alan McCormick, Broz, and most of the other guys on the team would purposely not ride beside Micheal because of the high chance that was going to occur. I finished 2nd overall in that stage race and the reason was because of getting half wheeled for weeks. I really hate to be half wheeled by guys I don’t know. 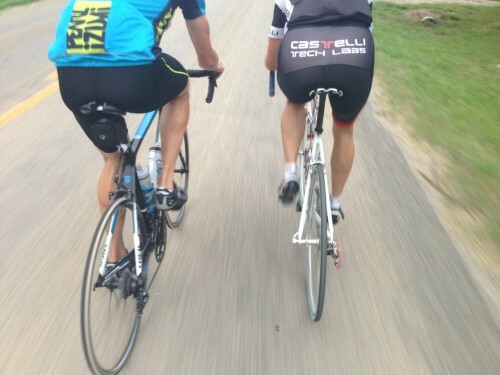 Getting half wheeled by complete strangers is worse than getting half wheeled by Tour de France winners. When you have no knowledge of how strong a rider is next to you, it just stresses you out that much more. It’s like you’re going up a huge climb, but you have no idea where the top is. This usually occurs when I’m really tired. Usually on a Monday, after a weekend stage race when I’ve stayed around a city to do the local group ride. Everyone that didn’t race on the weekend shows up and the Monday ride eventually turns into a pseudo race. I don’t mind it turning into a race, I just hate the pulling at the front, 2 x 2, at 28 mph. The same thing can happen on a MTB. When you go to someone’s local course/trails, and they are so excited that they take you out and ride at race pace on trails you’ve never rode on. It is a drag. Tom Ritchey had a reputation of doing that. Thomas Frischknecht would say that he needed to rest up to ride with Tom, if Thomas was heading out to San Francisco after a race. He say that Tom would take him out and just hammer him. I always felt for him, getting hammered after a Norba National or World Cup, by your sponsor. That is a pretty weird situation. Anyway, everyone that has ridden much has experienced being half wheeled. If you haven’t then you most likely are a half wheeler and just don’t know it. Half wheeling observation from behind. I can’t stand doing trainer, that’s for hamster. That’s why I gave up racing, starting to become hamster like. No longer fun. Much prefer riding outside. There is a pretty simple solution: the half-wheelee just needs to put their hand on the shoulder of the wheeler and gently pull them back even. If they are oblivious to what they are doing, there will be no ill will. You just have to have the confidence to know that you are not weak, just going beyond an expected tempo. Not sure I would put a hand on the Badger’s shoulder though, even in 2016. 50/50 chance of pulling back a stump! I have no problem getting half wheeled. I just let them slowly ride away from me, and the other riders in the group. When they look back and see that they’re 10 yards ahead of everyone, they usually get the hint. PCH is full of half-wheelers. I also learned who I could ride with (and who I just couldn’t). This made me laugh. I’m one of those ‘basement dwellers’ with a trainer, a TV and my wife on an exercise bike. The only way we could get all the stuff– elliptical, treadmill and the two bikes, was to stagger my bike and my wife’s bike so even on a trainer I’l stuck in half-wheel hell behind her. It is the off season, you were doing a fun ride for your birthday, the miles are piling up. Geez, I wish that was my biggest complaint in February. I beg to differ with Steve on his assessment of the benefits of riding an indoor trainer. The winter I decided I needed to get more consistent about training in the off-season (after my first year as a Cat 2 and getting it handed to me in any regional or faster event), I put in tons of hours on an indoor trainer. Mind you, I was in college full time and working almost full time, limiting my daylight hours to train outside. Riding indoors is obviously more difficult mentally, but I think the fitness benefits are greater than most think. Sure, there’s no climbing, but there’s also no coasting. And if you have the right trainer, there are ways to simulate hills and other drills to do to break up the monotony. My personal indoor record is 5.5 hours straight through without breaks. Way more difficult than one would think. How many breaks do you take when riding outdoors for 5 hours? I came into that spring stronger than I’d ever been. Nobody locally was even close to me in terms if fitness, even those who spent all winter riding outside. Granted, my training over that winter did include outdoor riding, but the majority of it was indoors. The trainer allowed me to be consistent (which I never was over the winter since I predominantly rode outside before then), and I think that is how I made the jump in fitness. I guess I’m saying Indoor riding has a place and is more beneficial than most think. Half wheel hell is what we always called it Steve … I just let them ride off into the sunset and if they don’t figure it out I scratch them from my riding buddy list.